US Ambassador to the United Nations Nikki Haley defended the President Donald Trump’s decision to recognize Jerusalem as Israel’s capital at an emergency meeting of the UN Security Council on Friday — slamming member countries for their treatment of Israel, in the face of harsh criticism over the controversial US policy move. The meeting — which was called in response to Trump’s Wednesday announcement about plans to also relocate the US Embassy to Jerusalem — highlighted the broad global opposition to the move despite Haley’s insistence that the US remains committed to a two-state solution. She also said that the US has credibility with both the Israelis and the Palestinians and any peace agreement would likely be "signed on the White House Lawn." "The United States is not predetermining final status issues. We remain committed to achieving a lasting peace agreement. We support a two-state solution if agreed to by the parties," Haley said. Several countries voiced their opposition to the US decision prior to Haley’s comments. "As was indicated by Macron, we regret the decisions announced by the US President on Wednesday to unilaterally recognize Jerusalem as the capital of Israel and to prepare for the transfer of the US Embassy from Tel Aviv to Jerusalem," said French Ambassador Francois Delattre. Egyptian Ambassador Abdellatif Aboulatta stated: "We’d also like to stress that such unilateral decisions is a violation of international legitimacy and thus it has no impact on the legal status of Jerusalem since it is a city under occupation." "There will also be grave negative impact of such a decision on the peace process between the Palestinians and Israelis," he added. The Palestinians are not a member of the Security Council but Palestinian Ambassador Riyad Mansour was invited to attend the meeting. "The US decision to award Israelis impunity undermines and essentially disqualifies its leadership role to seek peace in the region," he said. "Indeed, the resounding rejection of this provocative decision by the world leaders is indicative of the injection of all such illegal policies and measures and of the immense concerns regarding the dangerous implications of this decision including on the prospects for peace and security in the region and beyond," Mansour added. Haley also went on to condemn the United Nations for its treatment of Israel and said the US will not stand by while Israel is attacked or be lectured by other countries about its position on Israeli’s and Palestinians. "Over many years the United Nations has outrageously been of the world’s foremost centers of hostility towards Israel," Haley said. "The UN has done much more damage to the prospects of Middle East peace than to advance them. We will not be a party to that." 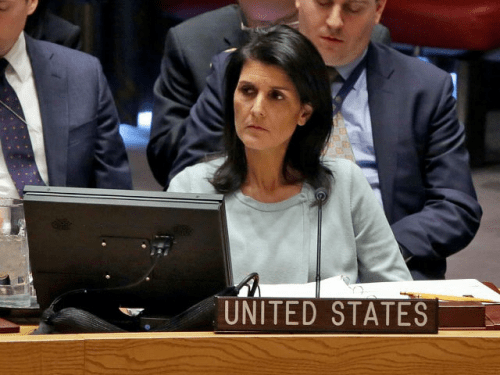 "The US no longer stands by when Israel is unfairly attacked in the United Nations," she added. "And the United States will not be lectured to by countries that lack any credibility when it comes to treating both Israelis and Palestinians fairly."